By the time your child begins speaking, her receptive language development (making sense of sounds, speech, and visual cues) is already well under way. Receptive language is one of three areas of language, along with expressive language and pragmatic/social language. As with any area of development, your baby may not follow this timeline exactly. The most important thing is that she goes through these stages in order. You can always check in with your pediatrician if you’re worried about her receptive language development. At birth your baby’s hearing is fully developed, which means that right away she is making sense of the world through what she hears. Her favorite sound? Your voice! She turns towards you (and may move her arms and legs) when she hears your voice, and it has the power to soothe her when she’s upset. She startles when she hears a loud noise, and becomes still when she hears a new sound. By the end of this stage she will react to pleasurable sounds and sights by smiling often. Your baby becomes interested in all sorts of sounds, from crinkly toys to whirring machines to barking dogs. She turns towards sounds and responds with pleasure or displeasure (laughing when you squeeze a squeaky toy or crying when you turn on the vacuum cleaner). By the end of this stage she understands the word “no” and responds to it. She also responds to changes in tone of voice, laughing when you talk in a high, silly voice and stopping what she’s doing when you use a flat voice to say “no”. This is a rich stage in your baby’s receptive language development. She now knows that she is separate from you. She recognizes her own name, and may react to your absence by crying. Her vision reaches adult clarity, which sharpens her ability to attach meaning to what she sees. Pediatric Speech-Language Pathologist Mandy Alvarez explains that during this stage your baby “develops the ability to predict what will happen based on visual and auditory cues.” For example, she knows that when the doorbell rings, you will open the door and someone will be there. Get ready to have fun with your baby’s blossoming understanding of speech! She now connects words with what they represent, turning to look at the family cat when you say its name, or looking up to the sky when you say “airplane”. A hallmark of receptive language is following instructions, which she begins to do if you give a her a simple one-step command like “sit here.” She loves games like “Itsy Bitsy Spider,” which show her beginning to connect words and phrases with corresponding gestures. By now your little one understands anywhere from 20-100 words, mostly names for common objects and people. When prompted she can point to major body parts like her eyes, nose or mouth, as well as objects in a picture. She’s getting better at one-step instructions like “give me the ball.” She’s fascinated by songs that rhyme, and she’ll want you to sing them over and over again. By the end of this stage your baby (a toddler now!) understands simple action verbs like bring, go and put. She answers yes/no questions by nodding or shaking her head. She enjoys books that tell simple stories. By the time she’s 2 years old, your toddler understands about 150-300 words. She understands simple wh- questions, like “Where’s your teddy bear?” and responds by locating and retrieving it. She begins to follow two-step instructions (get your teddy bear and put it on the couch). Alvarez points out that this opens the door to another hallmark of receptive language: Sequencing, or knowing how to do multi-step tasks in the correct order. You may observe this during pretend play, when your toddler acts out sequences like brushing a doll’s teeth, washing her face, hugging her, and putting her to bed. 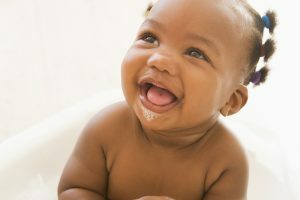 Your baby’s receptive language develops alongside her expressive language as she learns to both understand the world and express herself in it. You can learn more about the evolution of expressive language during baby’s first year here, and second year here.